Whoops! Saw these last week at A Friend to Knit With and just had to cast on. I used random leftovers of Cascade 220 Heathers. Finished one immediately, and then life got in the way. 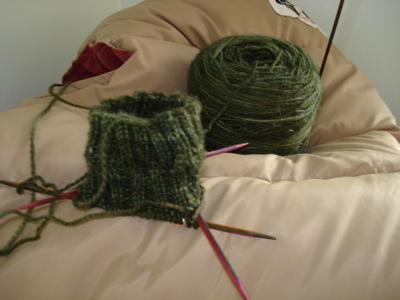 I’ll be happy with my schoolwork progress if I read two books this weekend, and after I finished the first one, I sat down to knit on my second mitt. One episode of Craftlit later, and I was weaving in the ends. Boh doesn’t seem to think I can do it. 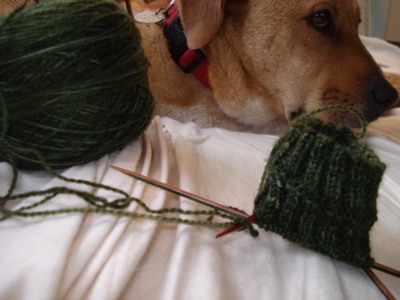 The yarn is sunshine yarns in a lovely variegated green — a gift from a knitting group friend months ago. 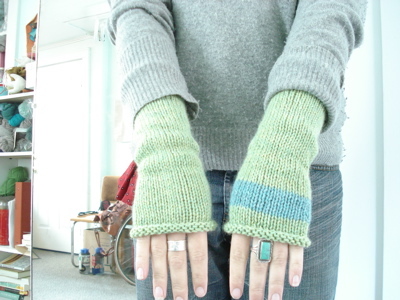 These pictures do not do it justice, but I am thrilled with how the cuff is coming along. I’m going to reward myself with some more knitting time if I can make some progress on this second book. Hope you’re having a great weekend! 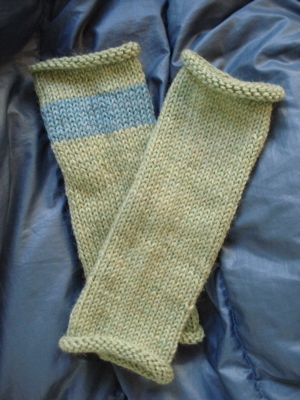 This entry was posted in knitting and tagged 2008, cascade 220, FO, knitting, sunshine yarns, through the loops mystery sock, toast by barefootrooster. Bookmark the permalink. I love your toast! 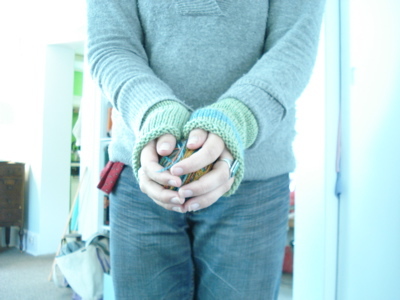 What do you think of armwarmers that don’t have a thumb gusset/hole? I’m glad your enjoying the yarn!